According to The Heritage Radio Network, “Doctor Jessica B. Harris damn near knows it all when it comes to African and Caribbean cuisines and culinary history. She’s a living legend“. She is the author of twelve critically acclaimed cookbooks documenting the foods and foodways of the African Diaspora and her latest, High on the Hog: A Culinary Journey from Africa to America, was the International Association for Culinary Professionals 2012 prize winner for culinary history. Her most recent book is My Soul Looks Back: A Memoir. In her more than four decades as a journalist, Dr. Harris has written book reviews, theater reviews, travel, feature, and beauty articles too numerous to note. She has lectured on African-American food and culture at institutions throughout the United States and abroad and has written extensively about the culture of Africa in the Americas, particularly the foodways. Dr. Harris has been honored with many awards including a lifetime achievement award from the Southern Foodways Alliance (of which she is a founding member) and the Lafcadio Hearn award as a Louisiana culinary icon from The John Folse Culinary Academy at Louisiana’s Nicholls State University. In 2010, she was inducted into the James Beard Who’s Who of Food and Beverage in the United States. In 2015, she received a lifetime achievement award at the Soul Summit, the first national gathering of African Americans in Food. The same year, she was awarded an honorary doctorate from Johnson & Wales University. In 2016, she received the de Masters Award from the American Association of Food Journalists. 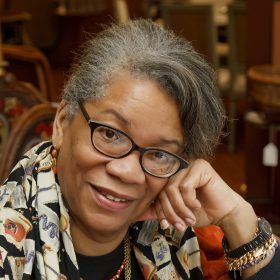 Dr. Harris was the inaugural scholar in residence in the Ray Charles Chair in African-American Material Culture at Dillard University in New Orleans where she established an Institute for the Study of Culinary Cultures. Dr. Harris has been a professor of English in the SEEK Program at Queens College/C.U.N.Y. for more almost five decades. She is a regular presenter at the annual FT Weekend Oxford Literary Festival, England. In 2012, Dr. Harris was asked by the Smithsonian’s National Museum of African American History and Culture to conceptualize and curate the cafeteria of the new museum on the Mall in Washington DC and is a member of the Kitchen Cabinet at the Smithsonian Museum of American History.